Normal wheelchair getting stuck? Get a Voyager! Large rear treaded pneumatic tyres help get you over uneven ground. 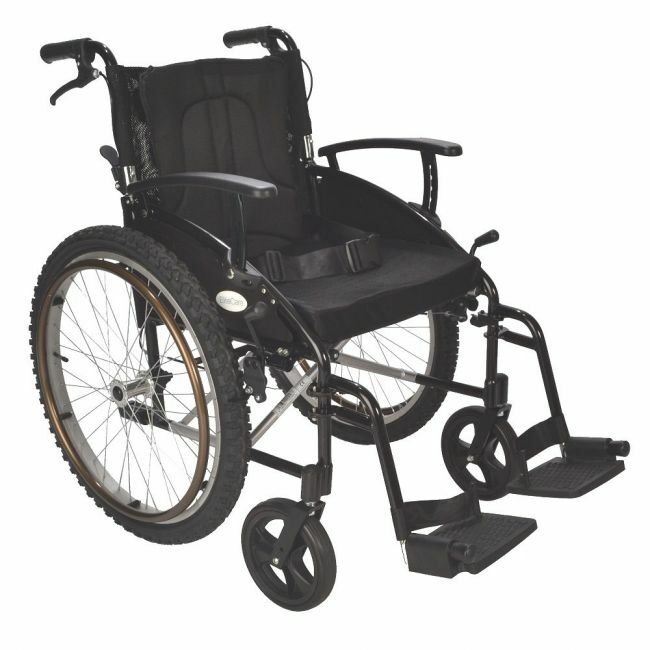 With a cushion, lapbelt and attendant brakes as standard this wheelchiar has everything you need. Folds flat for storage and transportation. The push handles also fold down and the footrests and rear wheels are removeable to make the chair as compact as possible for transport. Includes attendant handbrakes as standard, a feature not found on many self propel style models. The footrests are hight adjustable so can be set for different users and the armrest can be lowered to make accessing a table / desk easier. Cushion and padded removeable backrest are included as well as a supporting calf strap. 8″ diameter front solid castors. 1.5" wide. 24'' quick release rear wheels with pneumatic bike style tyres.